Anti-Islam Dutch lawmaker, who recently cancelled his infamous blasphemous caricatures contest, has warned Pakistan against declaring an early victory, disclosing his future plans of ‘exposing barbarism’. On Thursday, Wilders announced cancelling his plans to hold the blasphemous caricatures contest, against which Tehrrek-e-Labbaik Pakistan (TLP) was leading a rally to Islamabad. 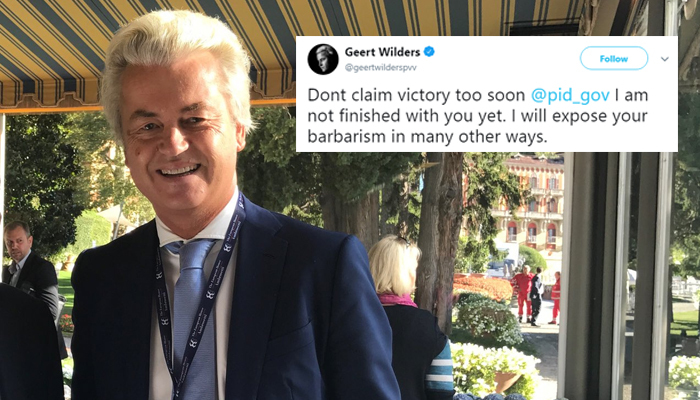 Geert stated on his Twitter account that he was cancelling the contest as it could pose danger of violence against innocent people. In a published statement he said he would never personally stop his campaign against Islam but the risk to innocents, and of attacks on the Netherlands, stemming from the proposed contest, were too great. “My point about the intolerant nature of Islam has been proved again by this,” he said.